"...In coordination with the LightWave 72 fiber Trunk Cable and the patent pending Chameleon Patch Cord system, the HVCM reduces optical crosstalk, maintaining data integrity. " the Chameleon 96-Fiber MTP Brand Cassette is built specifically for the Chameleon fiber/copper patching system. Two 48-fiber or four 24-fiber MTP brand connectors (backbone) are plugged into the rear of the cassette. In the front of the cassette are eight 12-fiber feed-thru MTP brand couplers for your patching. Inside the cassette is one unique 72-fiber harnesses with one 72-fiber MTP brand connector in the back breaking out to eight 12-fiber MTP brand connectors in the front. The Chameleon High Volume Cassette Module takes full advantage of the MT multifiber ferrule design. 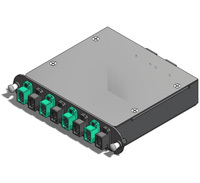 In coordination with the LightWave 72 fiber Trunk Cable and the patent pending Chameleon Patch Cord system, the HVCM eliminates optical crosstalk, maintaining data integrity. Smaller form factors in the trunking and patching system make the enclosure less cluttered and improves airflow to integral systems. The Chameleon Chassis, when fully loaded with HVCMs can make fiber management and patching a one rack solution.